So glad to hear how you are doing, Linda!! John and I enjoyed catching up with you in Albuquerque. Your life is such an adventure … be safe and get this done … no more injuries allowed. SO … are you saying that a short order cook will not be on your resume? Cook has never quite been on my resume. The 15-16 race Elaine made sure I was peeling potatoes, making the bread or deserts, and doing the dishes. Seems I am on the same challenge this time! YEA! 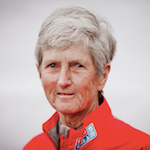 Hey Linda, glad to know that you are doing a finish leg on the Clipper race. For a minute there, I thought that maybe you were going to do it all over again. Either way, I am sure that you are enjoying it. We will be cruising the Western Caribbean (Aruba, Columbia, Panama, San Blas, islands of Columbia and Honduras, and Belize) in November. We always have a spare cabin available for you. I am hanging onto your schedule and hope to be down before the end of the year Ted. You and Barbara keep enjoying for all of us and keep the pictures flowing!